This lattice network results in 100% surface area coverage with a criss-crossing network of tube-like projection that form hexagonal and pentagonal patterns around the ball. Let me break this down for the layman: The golf ball's dimples look like tiny Honeycomb cereal. And this futuristic Honeycomb configuration is more aerodynamically efficient that your typical Cheerios design! 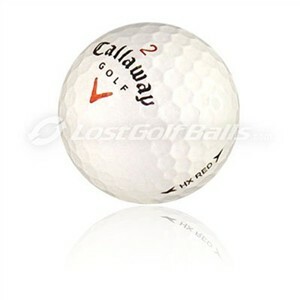 All joking aside, this is a good golf ball for the low handicapper. The ball is long and soft and holds up great in the wind. The HX Blue is a bit softer but doesn't fly off the clubface quite as hot. As a matter of fact, the Callaway's HX Red is to the HX Blue as Titleist's Pro V1 is to the Pro V1X. The former is softer while the latter is longer.